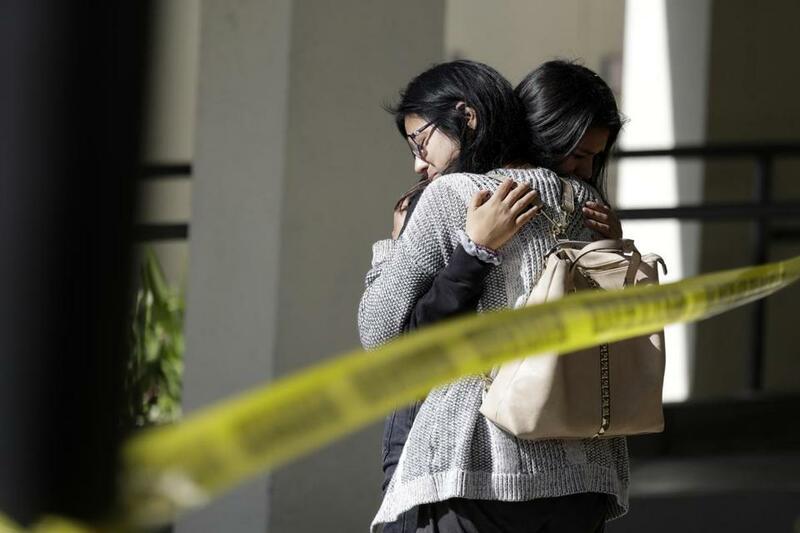 Mourners embraced outside of the Thousand Oaks Teen Center, where relatives and friends gathered in the aftermath of a mass shooting Thursday in Thousand Oaks, Calif.
‘‘The American people deserve real action to end the daily epidemic of gun violence that is stealing the lives of our children on campuses, in places of worship and on our streets,’’ said Rep. Nancy Pelosi of California, the Democratic leader who is running for a second stint as House speaker. The public’s attitude on guns is changing, said Democratic Rep. Ted Deutch, whose Florida district includes the Parkland high school where 17 people were killed in February. ‘‘We saw it start on Tuesday and we’re going to see it accelerate in January,’’ Deutch said. The Democrats’ new majority includes dozens of candidates who support gun control, including Lucy McBath in Georgia, whose 17-year-old son was fatally shot in 2012 and who made gun violence the centerpiece of her campaign. ‘‘I do think there’s new energy’’ on gun issues, even before the California assault late Wednesday night and an Oct. 27 shooting that killed 11 people at a Pittsburgh synagogue, said Kris Brown, co-president of the Brady Campaign to Prevent Gun Violence. ‘‘Our base is worked up, and people are reacting in a positive way at the ballot box,’’ said Brown, who campaigned with the three Virginia Democrats in the final week alongside a stream of volunteers. ‘‘A large number of folks showed up and knocked on doors and said they finally have a candidate who will do something about gun violence,’’ she said. Wexton, Spanberger and Luria all made gun violence a central issue in their campaigns — disproving the notion that gun control is a ‘‘third rail’’ of politics that Democrats should not talk about, Brown said. ‘‘We’re finding candidates who aren’t afraid to talk about this issue,’’ she said. McBath said her victory over Republican Rep. Karen Handel sent a strong message to the country. ‘‘Absolutely nothing — no politician & no special interest — is more powerful than a mother on a mission,’’ she said in a tweet. For years, GOP lawmakers thought they could avoid talking about gun control while accepting campaign contributions from the NRA and promoting an A rating from the group, he said. ‘‘They learned this week that just won’t work anymore,’’ Deutch said.